The first comprehensive Jenway catalogue is published in time for ACHEMA 2009, with over 90 colour pages giving full technical details and ordering information. Recent product releases appearing in the new catalogue include the 6315, 6800 and 67 series spectrophotometers, as well as updated electrochemistry products for the measurement of pH, conductivity and dissolved oxygen. Complementing the launch of a new website at www.jenway.com the Jenway catalogue includes details of several additions to the spectrophotometer range. The 6315 is an advanced measuring system using a pulsed xenon lamp, the 6800 is a true double beam instrument which includes Jenway Flight Deck software, and the cutting-edge user interface and novel operating system of the new 67 series spectrophotometers offer the simplest, most intuitive operation in their class. Also featuring in the Jenway catalogue are three updated pH meters, a combined pH and conductivity meter, two conductivity meters for routine and GLP applications, and a dissolved oxygen meter with full GLP support. According to Robert Skehens, Bibby Scientific Marketing Director, "Previously Jenway product information was only available in a series of range-specific leaflets. 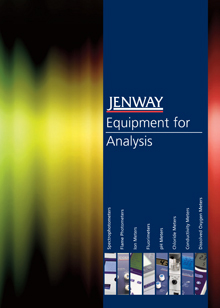 With the launch of the first Jenway catalogue we are able to give customers a comprehensive insight into all of our high quality scientific instrumentation. Whether they refer to a hard copy or access the information online via the new Jenway website, the catalogue will be essential reading for users of techniques including electrochemistry, spectrophotometry, fluorimetry, colorimetry and flame photometry."